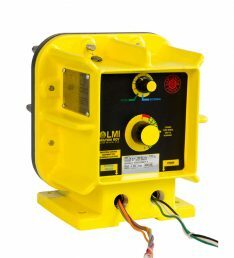 LMI Explosion Proof Pumps – E7 Series Electronic pumping for hazardous locations and environments. Here are a few options you have with the E7 Series: Four Function Valve, Repair & Preventive Maintenance Kits, Calibration Columns. Control code 7 for Pulse Input / Dual Manual Control. Another benefit is Manual control or external control without the need for costly motor and control options. Wend designing these, LMI took into consideration to meet or exceed all standards for Class I, Division I, Groups C and D and Class II. If you have any questions, please do not hesitate to give us a call.